Love and Berry Dress Up and Dance! 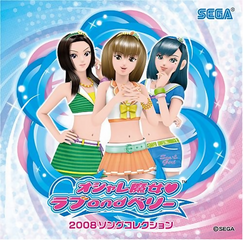 Complete Song Collection (オシャレ魔女 ラブ and ベリー コンプリートソングコレクション), also known as Oshare Majo Love and Berry: 2008 Complete Song Collection (オシャレ魔女 ラブandベリー 2008コンプリートソングコレクション) in 2008 CD release, is a compilation album featuring all tracks from Oshare Majo Love and Berry. The album was made available as a digital download on Amazon and iTunes in 2013, with individual tracks costing ¥150, US$0.99, £0.79 (£0.99 on Amazon) or €0.99 (€1.29 on Amazon). EN: It's Summer, It's Pool, Let's Go!